A day or two out of port, we ran into some weather. We could see the squalls approaching: black clouds roiling across an endless sky. Each time one hit, the wind howled, the rain pelted us, and the boat heeled a little more. Then a wall of water crashed over the port side and went right through my foul-weather gear, running in cold streams down my back. I was seasick and exhausted from traveling all night to get to Bermuda and then standing watch in the middle of the night. “You can check out any time you like, but you can never leave.” A line from the Eagles’ “Hotel California” fluttered through my mind. Here, floating on a restless sea, utterly dependent on my fellow crewmembers and a piece of cloth catching the wind, there was—really—no leaving. No matter how bad the weather got or how many times I surreptitiously puked, I was on this boat for the duration. And at that moment, seven days sounded like a very long time. Just a week or so earlier, I had been drinking tea at my dining room table in Eugene, idly scrolling through Facebook posts. I saw that 5 Gyres, a group that researches plastic pollution in the ocean, had a last-minute spot available on the Sea Dragon, a steel-hulled, 72-foot vessel originally built to sail around the world. The boat was leaving Bermuda in eight days to conduct research in the North Atlantic Gyre, where the crew would be gathering water samples to document the presence of plastic. Then it would sail north to Newport, Rhode Island. What is a gyre, you may be wondering? Gyres, pronounced with a soft “g,” are massive, slowly circulating vortexes in our oceans (two in the Atlantic, two in the Pacific, and one in the Indian Ocean), created by a combination of wind-driven ocean currents and the Earth’s rotation. The North Atlantic Gyre (NAG) is bordered by four major currents: the Gulf Stream, which flows north along the East Coast of the United States; the North Atlantic Current, which flows across the North Atlantic to Europe; the Canary Current, which flows south along the west coast of Europe and North Africa; and the North Equatorial Current. The eye of the NAG is the Sargasso Sea, the Earth’s only sea that is defined by the currents that border it rather than shores. This remote body of water is named after the yellow-brown, rootless seaweed called sargassum that floats in large masses on its surface. It’s the “floating, golden rainforest of the sea,” according to Sylvia Earle, marine biologist, explorer, and former chief scientist for the National Oceanic and Atmospheric Administration (NOAA). Sargassum, found only here, supports an astonishing amount of plant and animal life, including about a third of the Atlantic Ocean’s plankton. Many small crabs, shrimp, and octopuses call it home, including one species of crab that is so perfectly camouflaged it is almost impossible to spot, and a fish that has evolved prehensile pectoral fins that allow it to “walk” through the seaweed rather than swim. The Sargasso is the primary nursery for endangered freshwater eels, which migrate there from both Europe and America at the age of about 10 years. Here they mate and the female eels spawn in the warm water. The baby eels are carried around in the gyre for about three years, after which they migrate back to the continents and swim up the rivers. Loggerhead sea turtles also use the sargassum for a nursery, hatching out on beaches between Florida and North Carolina and immediately scrambling to the ocean and making their way about 800 miles to the Sargasso, spending a few years in the safety of the seaweed. Then they travel the currents for six to 12 years, making a full circuit of the Atlantic and returning home to the North American East Coast only when they are big enough to fend off predators. The Sargasso truly is a wonderland. It’s the bluest, clearest water I’ve ever seen. But there’s a catch. The same currents that bring creatures to the gyre, and which sustain them, also bring to this fragile ecosystem large quantities of discarded, decaying plastic. In fact, all five gyres are collecting plastic at an alarming rate. A five-year research study published in late 2014, coauthored by marine biologist and 5 Gyres director Marcus Eriksen, estimated that ocean surface waters hold nearly 300,000 tons of plastic, equivalent to the weight of 1,500 blue whales, the largest animals ever to have lived on Earth. Scientists estimate that there are about 5.25 trillion pieces of plastic adrift in the ocean. Researchers arrived at these numbers by sampling ocean water at nearly 1,600 spots and combining that data with an ocean circulation model. Because the sampling only includes water a few feet under the surface, it doesn’t count plastic that has sunk to the bottom, that is floating in the middle of the water column, or that has been eaten by animals. Studies correlating the amount of plastic that heads to the sea with the amount found near the surface suggest that the sea floor may hold far more than the surface. A 2014 study by Andres Cozar of the University of Cadiz in Spain estimates that as much as 99 percent of the plastic thought to be in the ocean is unaccounted for. Without allowing myself to think of all the reasons why I couldn’t or shouldn’t go on this trip, I wrote, “I’m interested” underneath the Facebook post. And pretty soon I was expediting a passport and rushing to get a magazine to print and driving to Portland and boarding an overnight plane to New York, and then another one to Bermuda. An hour after I arrived, I was on the Sea Dragon, stashing my gear and checking out my bunk, the bottom one in a stack of three, across from two more bunks stacked on the other side of a narrow walkway. The weather was beautiful, but the forecast was for a big storm to arrive in a few days. So we left a day early (just a few hours after I got there) and headed into the Sargasso Sea to get some sampling done before the Nor’easter showed up. Every four hours, we hurled the manta trawl, which was equipped with a micron mesh plankton net, off the Sea Dragon’s side. We slowed the boat’s speed so the trawl could follow along for an hour. Then we hauled it in and strained the contents through a sieve. 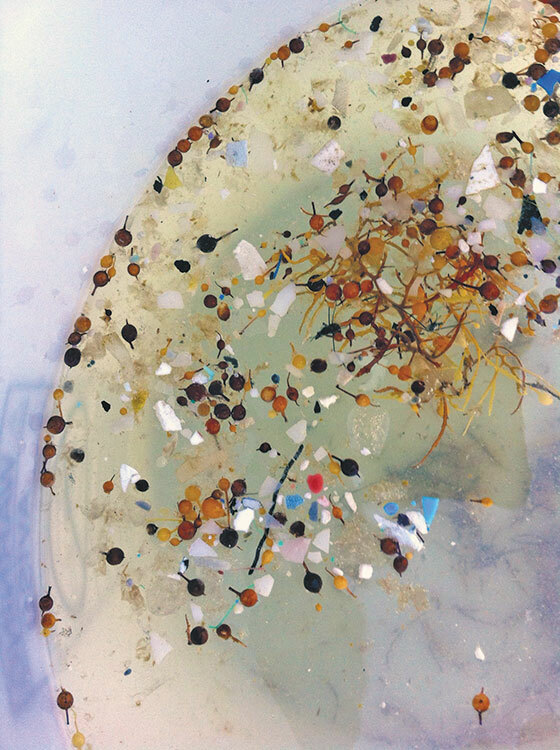 We were left with sargassum, tiny crabs and other sea creatures, and—always—plastic. Decaying chunks of blue and white and yellow, mostly no larger than a fingernail, were mixed into every one of the 16 samples. Each “catch” was put into a bottle and labeled with the latitude and longitude where it was gathered, later to be sent to a lab for analysis. A single yogurt container may end up as hundreds of tiny pieces that float near the surface. Eventually, it becomes “plastic plankton,” says Wood. Because the fragments are quickly colonized by tiny marine organisms, they are shielded from sunlight and take even longer to break down. They may sink into the water column due to their increased weight, or, borne about by ocean currents, deposit invasive marine life near the sensitive coastal environments where they eventually land. Look around at the grocery store or any retail outlet, and you’ll see plastic everywhere. It’s a material that is designed to last practically forever, but the items it encases are often used only once—maybe just for a few minutes—and then thrown away. Once discarded, a plastic bag takes about 20 years to decompose, a water bottle up to 450 years, and monofilament fishing line, 600 years. Americans use about 100 billion plastic bags every year. If you tied them together, they would circle the Equator 773 times. The average American also throws away about 185 pounds of plastic every year. According to the Environmental Protection Agency, only 9 percent of the 33 million tons of plastic generated annually in the US gets recycled. About 40 percent goes to controlled landfills, and the other roughly 50 percent is unaccounted for. The top three items found during 2013 Ocean Conservancy cleanups around the world were cigarette butts with plastic filters (more than two million), food wrappers (more than 1.5 million), and plastic bottles (nearly a million). Other items, found by the hundreds of thousands, included bottle lids, plastic straws and stirrers, and plastic bags. Enough fishing line was collected to go up and over Mount Everest five times. Consider this scenario: A plastic cup falls out of a garbage truck, ends up in a storm drain, and flows directly to the sea. While being slowly swept away from shore, it begins to break down, becoming more porous and absorbing chemical pollution from river and harbor mouths. According to a 2008 study published by Chemical and Engineering News, the plastic generally absorbs many more toxics than it was originally made with—things like PCBs and dioxin. 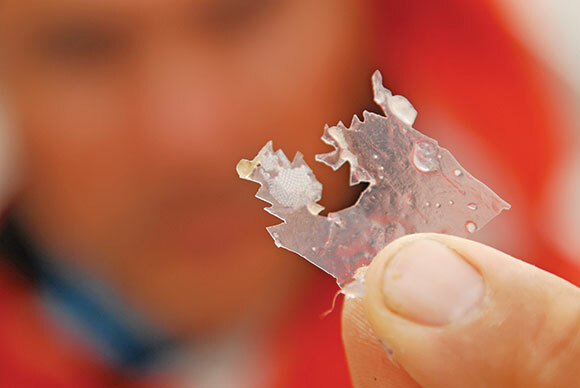 Out in the ocean, it’s common to see pieces of plastic that are peppered with bite marks. By this time in the plastic’s life cycle, any fish or sea creature that swallows it is ingesting not just the chemicals the plastic was originally made with, but potentially more than 50 persistent organic pollutants. Hideshige Takada, a Japanese scientist studying plastic particles in the ocean near Japan, found them to be one million times more toxic than the ambient seawater in which they floated. On a larger scale, thousands of fish, marine mammals, and birds are killed each year by ingesting plastic or by getting entangled in what are called ghost nets (fishing nets lost at sea). Fifty to 80 percent of dead sea turtles that are found have ingested plastic, with plastic bags, which can be mistaken for jellyfish, turning up as the most commonly found item in their stomachs. 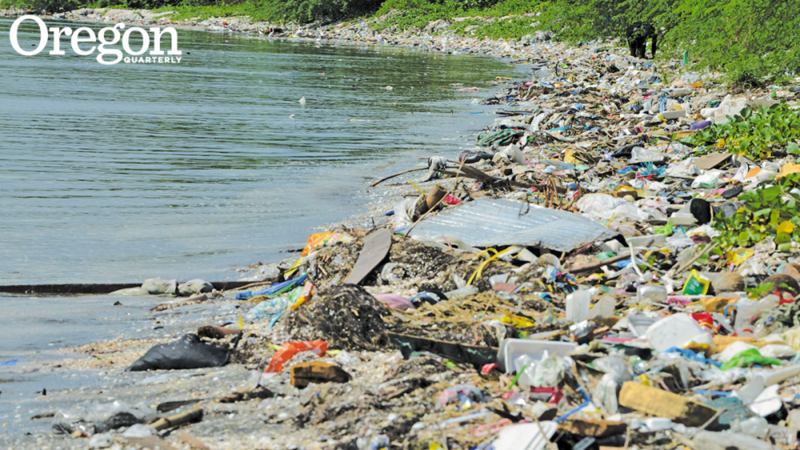 However, large chunks are not the only source of plastic in our waters. There are smaller, more insidious sources. When we wash our fleece jackets and other clothing made of synthetic materials, thousands of tiny fibers slough off and slip into the wastewater stream. A study published in May 2015 in Proceedings of the National Academy of Sciences tested the water that drained out of washing machines and found that fleece garments shed up to 1,900 tiny fibers every time they are washed. Nurdles, the raw materials that are melted down to create most plastic goods, are another source of plastic pollution. The United States produces about 60 billion pounds of these tiny plastic balls annually. Unfortunately, many of them escape during transport and manufacturing, and end up in the marine environment. Then there are polyethylene microbeads, those specks of color and texture you find in some toothpastes, lip balms, moisturizing creams, exfoliators, and body scrubs. A single tube of toothpaste may contain more than 300,000 of these tiny plastic beads. Once they go down the drain, they are too small to be caught by water treatment plants, so they head directly into rivers, lakes, and streams. It’s estimated that 300 tons per year end up in US waterways. They look like fish eggs, so they are snapped up by marine animals, providing fish with a diet of plastic laced with pesticides, phthalates, and heavy metals. They travel through the food chain, and have been found in the stomachs of tuna and swordfish. And they are not just in the ocean. Research released last January revealed enormous numbers of microfibers and plastic microbeads in the Great Lakes, particularly in Lake Erie. Many people are working on solutions to this overwhelming problem. One of the most well known is the Ocean Cleanup Project, which seeks to eventually clean up half the plastic in the North Pacific Gyre by deploying huge booms, anchored to the sea floor, to catch and concentrate the plastic for removal. However, there are a number of potential drawbacks to this idea, including the fact that the wild, unpredictable ocean is prone to tearing apart even the best manmade materials. Also, the gyres are in international waters. Should the booms be successful in trapping large amounts of plastic, what country would accept the garbage? And what about the “bycatch”—marine life that is caught along with the trash? 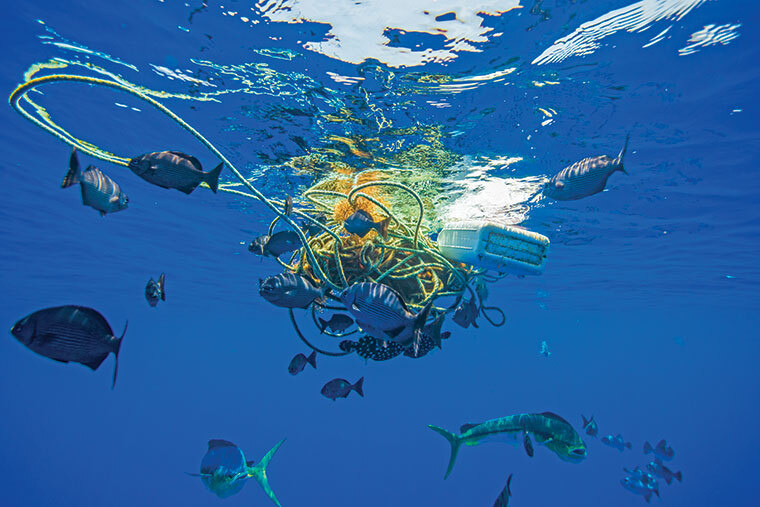 A "net ball," a mass of discarded nets, ropes and plastic, floats among the fishes in the incredibly blue Sargasso Sea. It is up to all of us to stem the tide of plastic flowing to the sea, says Sutherland, the UO biologist who studies zooplankton. “My reaction to the idea of trying to clean up the oceans is similar to my reaction to schemes for removing excess carbon dioxide from the atmosphere,” she says. “It makes a lot more sense to take a conservation approach. Sailing is an exercise in mindfulness. Each step calculated, each three-point hold (two feet, one hand) anticipated as you move around the boat. You can’t leave anything around that someone else might trip over or bang into. If you open a cabinet door, close it. If you take something out of a drawer, put it away when you’re done. Counters and tables clear at all times. Nothing left out or strewn around. This mindfulness stayed with me when we got off the Sea Dragon in Newport, Rhode Island. I saw plastic bulging out of trashcans, discarded in the gutter, and serving as ubiquitous packaging. I was offered a plastic cup at the coffee shop on the dock, but I persuaded the server to lend me a ceramic cup to take to my room. Because all my clothes were wet, I went to a store and bought three t-shirts. I declined the plastic bag and folded them neatly into a paper bag no bigger than my hand. Sailing into the most remote part of the Atlantic showed all of us on the Sea Dragon that no matter where we go, there is no “away.” Our actions affect even the most distant parts of the globe.